Kuwait –12 December 2018:- Abdulmohsen Abdulaziz Al Babtain Co., the authorized agent of Renault in the State of Kuwait invites customers to lease and enjoy models of the Renault Koleos, Renault Megane and Renault Megane GT. 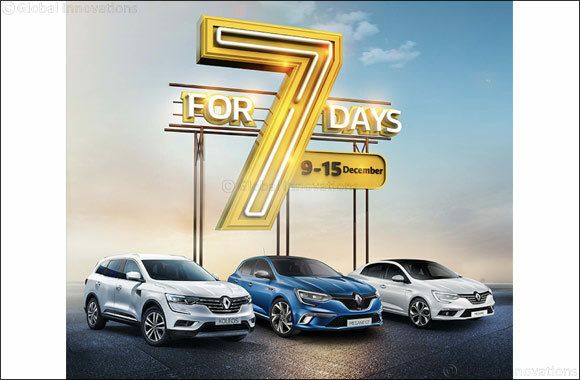 The offer that ends on Saturday, 15 December 2018 comes as part of the company’s 70 years celebration to ensure that Renault fans experience the best deals. The Renault Megane is equipped with generous space for its occupants i.e. dimensions of 4.63m long and 1.81m wide, and a record wheelbase in its class of 2.71m. Owing to its dynamic styling and advanced features, the new Megane represents the next level10 yw in the compact saloon category. It comes with a 1.6-litre engine, 115hp designed to enhance driving enjoyment and reduce fuel consumption. The Megane GT is tuned by Renault Sport and boasts a 1.6L and TCE 205 HP engine mated to 7 speed dual clutch automatic gearbox, achieving a swift 0-100km/h in just 7.1 seconds. Combining dynamic style and ride comfort, the model offers first-class road handling thanks to 4CONTROL. The model delivers a connected driving experience thanks to R-LINK 2, which serves as the car’s control centre. Showcased via a modern 8.7’ touchscreen, R-LINK 2 ensures an ‘Easy Life’ by offering a range of in-car features including easy park assist, rearview camera, Renault Smart Card with walk-away closing, as well as an active emergency braking system, 6 airbags or even the Renault Sport mode switch button: RS Drive. Renault Al Babtain encourages its customers to discover the ‘best in class’ models by visiting the showroom located in Al Rai and take advantage of the exclusive offer.